In contention for promotion back to La Liga, Spanish Segunda División (second division) side Granada Club de Fútbol have dropped a limited edition 2019 commemorative kit from techincal partner Erreà. The new retro-styled shirt is a modern interpretation of the first home jersey worn by the Andalusian club when it began play in 1931. As such it departs from the team’s current red and white hooped primary look in favor of a blue and white vertical stripes. The Granada CF 2019 commemorative kit also has an oversized, old school polo collar with a drawstring placket to recreate the look of football shirts of the 1930s. It also bears a classic Granada crest and has a print of one of the team’s early home tickets on its inside neckline. 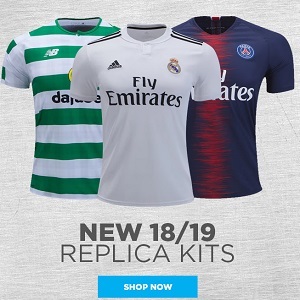 Only 200 of the commemorative kits have been made. They are on sale at the club’s online and brick and mortar shops. Check out our Retro Kits section for more classic football shirt re-issues.